2) Book a Day Use Room for longer transits to sleep/rest. Book these in advance on the Zurich airport website. 3) Showers are available for CHF15 including towels. For those unfamiliar with Switzerland’s most accessible location, let’s start with a few facts – Zurich Airport hosts more than 24 million passengers a year, approximately 67,000 passengers per day. There are 1,400 public transport services each day made up of rail, bus, tram and winter sports coach transfers. And with 193 shops and restaurants, you’ll never run out of things to do while in transit at the airport. 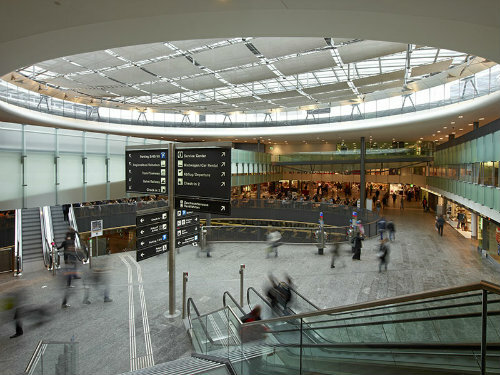 In 2011 Zurich Airport won World Travel’s ‘Best Airport in Europe’ Award. Swiss Airlines, Lufthansa and Austrian Airlines will all be happy to check you in for your flight at Check-In 1 & 3, with most flights available for evening check-in the night before your flight departure, from Check-In 1, 8pm-9:45pm (flights to Pristina, Ohrid & Skopje are exceptions to this). Web check-in is also available to you at swiss.com/en , as well as the Self-Service Check-In machines throughout the airport. The latest check-in technology offers you even more flexibility by using your mobile. Just go to mobile.swiss.com on your internet-enabled mobile phone to start the check-in process, and your boarding pass will be sent to you via email or SMS, no printer required. If you are travelling to or from countries outside of the Schengen group you will need to negotiate passport control with your onward travel documents ready, and you should check for any visa requirements well before your departure from Australia. Plenty of transport options are available to get you from the airport if you are going to be staying in Switzerland for any length of time – the airport taxi rank is located in front of Arrivals 1 & 2 and a taxi ride from the airport to the city centre costs approximately CHF 60 (approximately $70 AUD). Swiss Federal Railways have a travel centre in the Check-In 3 area where the ticket counters are open 6:30am-10:15pm. Also there are ticket vending machines in Customs Halls 1 & 2. Display of the current waiting times at security to allow you to plan your route to the gate more easily. Interactive maps of the airport with information on shops, restaurants and services, so that you can find your favourite shop even faster. Book your parking conveniently online for a stress-free journey to the airport. VIP Service – Zurich Airport has a VIP Service designed for passengers with high expectations of comfort, discretion and time management. There’s an experienced team ready to look after you and help you enjoy your stay in Zurich Airport, regardless of your airline or booking class. Transit packages and a limousine to/from your hotel are also available on application. Prices start from CHF300 (approximately $330 AUD) for the first person and CHF120 (approximately $130 AUD) for each additional person. Airline Lounges – Lounges operated in Zurich Airport include oneworld, Swiss Arrivals for First or Business passengers, Swiss Business offering work stations with free internet access, Swiss First including meals and day rooms to freshen up and Swiss Senator including meals and shower facilities. Regardless of class of travel you can enter the Panorama Lounge or the Dnata Lounge for a small fee, CHF36 for the Panorama lounge which is a bit nicer than the Dnata lounge. Priority Pass holders, USD99 to join, can access the SWISS lounges for their regular access rates of $25 per entry and $25 for a guest. This is a great way to access the best lounges in the airport and can also be used at over 600 airports around the world. A great way to add some luxury to your trip for a very small cost. Day Rooms & Rest Area – If you have a longer transit time in Zurich and would like to use the time to rest, there are several options available to you. Single, double or family dayrooms are furnished with comfy single beds and a wash basin, with full shower and toilet facilities located nearby. Alternatively there is a rest area with reclining chairs and woolly blankets, perfect for a quick nap or an inexpensive option for an overnight stay. Lockers are also available for storing your valuables while you rest. Prices start from CHF 25 (approximately $30 AUD) during the daytime for a rest area chair for 3 hours or less. Rooms are subject to availability on arrival, or they can be booked in advance through Zurich Airport’s website. 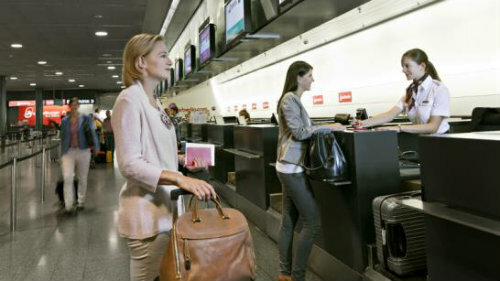 Family Services – Zurich Airport is one of the few in the world to offer staffed family rooms. Access to the rooms are free of charge, however this is not a babysitting service and children must be accompanied by an adult. Staff are there to supervise the children’s play, keeping everyone safe and having a great time. They can also keep you updated on your flight status and help with minor travel glitches. Baby facilities include change tables, private feeding rooms and kitchenettes for heating formula or meals. For slightly older children there are toys & activities such as dolls, soft toys, story books, computer games, play stations, football games, painting and building sets, ready to go and set out in bright, airy play spaces. Showers – Showers are available in both the public and passenger areas of the airport. Located in Transit D near the day rooms, and open around the clock. Cost is CHF15 (approximately $20 AUD) and includes towel, shampoo and shower gel available from day room reception. Internet access – Zurich Airport has internet stations available with the first 60 minutes of surfing free of charge. Additional internet use can be purchased with a credit card, with the free 60 minutes of credit refreshing automatically every six hours. Internet stations are located at various points both in the public and passenger areas of the terminal. The best of Swiss products are available at Zurich Airport, as well as all the big international brands, allowing you the opportunity to find the perfect gift for loved ones at home. Some of the highlights include Bally, Bulgari, Swatch, Atelier, Montblanc, Swarovski and Tiffany & Co. Of course, there are also plenty of duty free stores in both the public and passenger areas of the airport with the usual variety of goods at tax & duty free prices. Shoppers must present their boarding card for their flight at the checkout. If you’d like a meal in the airport there is a wide variety of cafes, restaurants and bars such as Marche Bakery, Sports Bar and Montreux Jazz Café. Some of the services available during your transit include Credit Suisse bank, Travelex currency exchange and Global Blue for VAT reclaims.